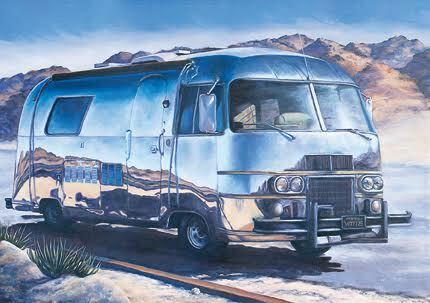 The Tin Goose was just an old school bus parked outside the Joshua Tree Saloon until Marcia Geiger decided to make it the subject of a painting. In Geiger’s version, the Goose looks at you head-on and unflinching. It seems to be reciting the dreams and defeats of every seeker who ever lived aboard. 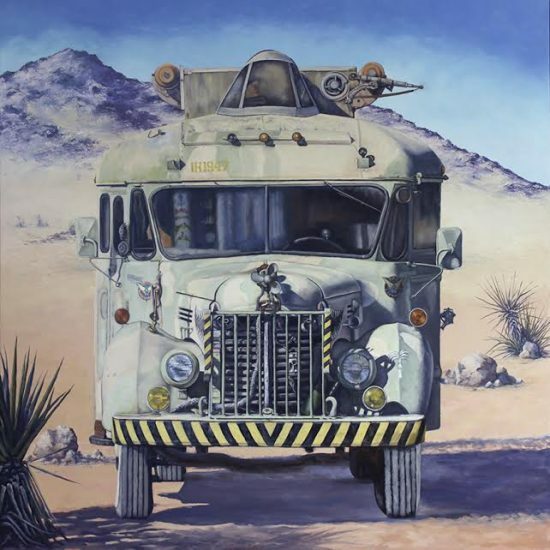 The piece won the Preston Ormsby Award for Excellence at the 2016 Palm Springs Artists Council Exhibit (ACE Show), and the image became an instant High Desert classic. 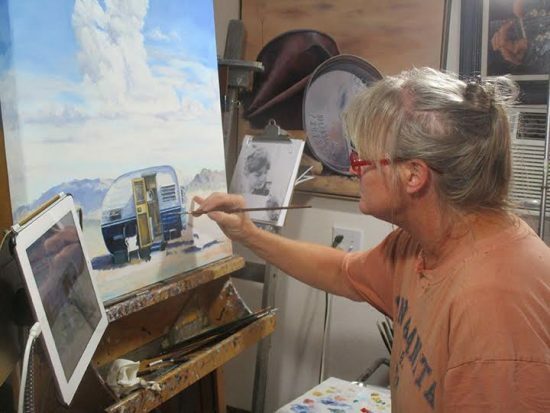 The Nebraska-born artist has made a years-long study of the “infinite procession” of transformed buses and campers she’s encountered in the Mojave. Derelict trailers are as ubiquitous here as the 1940s jackrabbit homestead shacks. When Geiger zeroes in on a particular vehicle, she tunes into the backstory about the veterans, drifters and retirees who sought reinvention in a “canned ham” or Airstream. Often her campers appear abandoned, yet the owners themselves are revealed via an alchemical trick of the artist. 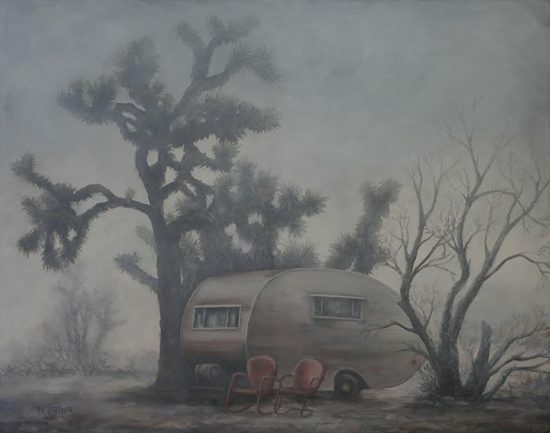 Cheryl Kandel has collected several pieces by Geiger and says: “I am drawn to the subject matter because trailers and campers represent the freedom of the road to me.” Along with Mobile Desert Domiciles, as Geiger calls her series, the artist looks at other “real time” subjects such as old skulls, saloons, machinery and guitars. It’s all consistent with the notion that objects contain souls and stories, just the same as human subjects. 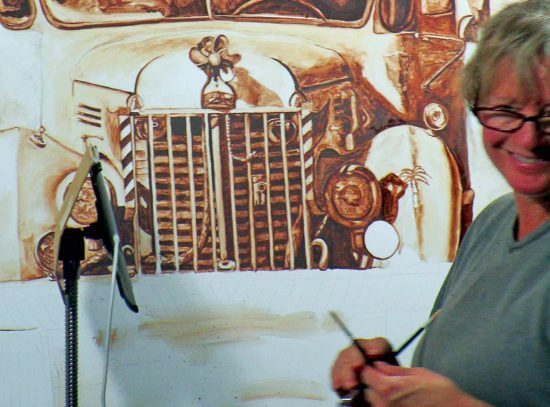 Marcia is well-known in desert art circles as a member of Palm Springs’ Desert Art Center, the Palm Springs Art Museum Artists’ Council, and the Joshua Tree Art Gallery–as well as being a board member for the Morongo Basin Cultural Arts Council. 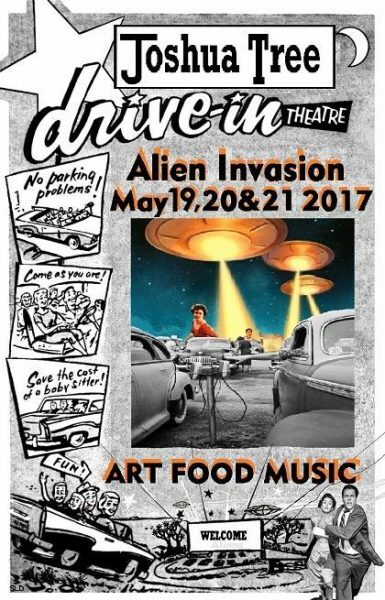 You can see her work at the upcoming Alien Invasion event in Joshua Tree May 19-21, 2017. In this Q&A she talks about the inspiration behind her highly individualistic “tin can” domiciles. —Please fill us in on your background. I grew up on a farm near Cozad, Nebraska. The town was founded by Ashcan School leader Robert Henri’s father, John J. Cozad, and Henri spent his boyhood there. (Anyone interested in the life of Henri should read “Son of the Gamblin’ Man” by Mari Sandoz). I have been an artist as long as I can remember, but my talents were humored, at best, by the people I grew up around, if not outright discouraged when I showed an interest in pursuing an artistic career. Although I studied Commercial Art at a community college in the early 80s, I couldn’t really get into it, so my body and spirit wandered pretty aimlessly for a many years, until a 6 week house-sitting job in Joshua Tree came my way in1989. I have lived in the area ever since. In 1996, I moved 12 miles north of town to Landers, on a very quiet 5 acres. Apart from primary and secondary school art classes, and an associate’s degree in commercial art (circa 1983), my only art instruction was from Irene Scoggin Bertrand, who lived in the high desert, but had moved to DHS by the time I met her in 1989. She was giving painting lessons once a week at the Joshua Tree Community Center. The mid 90s and early Naughts were not a creative time for me. I got married, helped my husband run a business, and learned bookkeeping skills (which still supports my ‘habit’, enough to pay the bills and keep the wolves at bay, anyway). In 2005, I slowly began painting again, and joined Joshua Tree Art Gallery in 2010, featuring paintings of vintage guitars being played. —You once said that the desert adopted you rather than vice versa. Can you tell us about the desert as a subject in your work. I came to the desert tired from my wandering, and had never been here before. The people I house-sat for came back, saw my potential, bought me painting materials, and arranged for me to take lessons from Irene Scoggin Bertrand. That was probably far more of an influence on me than the desert itself, but I have become acclimated to it, and couldn’t think of living anywhere else at this point. —What is your piece for Alien Invasion? My featured piece is the digitally created image (a departure for me, although one of the skills I have developed along the way was some expertise in Photoshop), called “Company’s Coming”, printed on brushed aluminum. 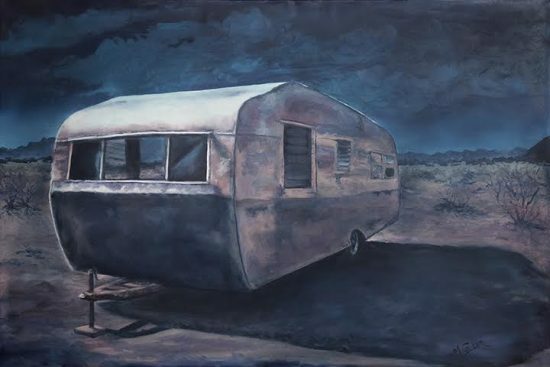 I will also have printed giclees on canvas of some of my other work, like the “Tin Goose”, and of course, trailers. —What was your very first trailer painting? My first was of a small trailer in Pioneertown, which belongs to a friend, Constance Walsh. After painting a realistic version (Lanternlight-Moonshadow), at the time I needed a break from realism, so I was doing what some people called a ‘paint by number’ style, where I laid down flat areas of paint, and forced myself to not try and blend the edges. It was difficult, but successful, and it helped me loosen up somewhat with my painting style. When I went back to that style, I kept an eye out for funky old desert trailers and vehicles to paint. —Vintage trailers are trendy now but you discovered them years before they were hip. What was the attraction for you? To paint successfully, I really need to have a deep interest in my subject. I remember as a child on the farm, an aunt and uncle would come out from Illinois with their little canned ham trailer for a few days for pheasant and duck season in the late fall. I have always loved both being in small spaces, and the wide open spaces I grew up in, and the idea of having both at once excited me. Perhaps that is what also has kept me here in the desert, so many small spaces in one very large open space. 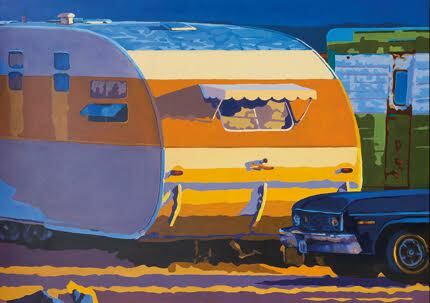 My interest in trailers never wanes, but my interest in painting them comes and goes. I have also done a series on koi for example, the guitar series I mentioned earlier, and right now I am getting ready to do a series on smoke trees, and another of ‘doors in walls’, of which I hope to have a few of both completed by this autumn. —You’ve mentioned “realtime subjects” such as the wall above the Joshua Tree Saloon bar. Can you tell us more about that painting? It is natural, for me anyway, to change and evolve as the world around me changes and I experience life changes personally. 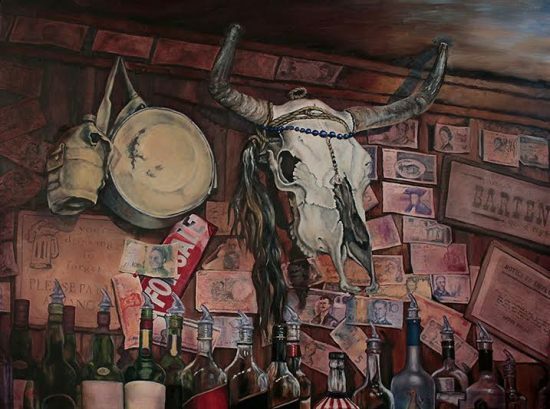 I have been going to the Joshua Tree Saloon for some time now, but never really got the inspiration to paint any of it, until I noticed this wonderfully decorated and placed bovine skull above the bar, surrounded by foreign currency, and a couple of canteens. At the time I was doing a series on skulls, so it naturally caught my interest. I suddenly saw a story there: The implication of a skull, being dried up, next to empty canteens, surrounded by the currency of travelers who came there to quench their thirst in the desert. The local watering hole, serving everyone who needs to come in from the oftentimes harsh weather here and replenish themselves. —Did you actually ever live in a trailer? Shortly before I moved to the desert, I lived in Shreveport (Bossier City, actually) La., for a few months. I lived in an old trailer-park type, at a hotel who rented them out to transient residents. If you think of the Roger Miller song, “King of the Road”, that would be it -without the stogies! It was awful, and probably was a big motivation for me to take that house-sitting job in Joshua Tree. 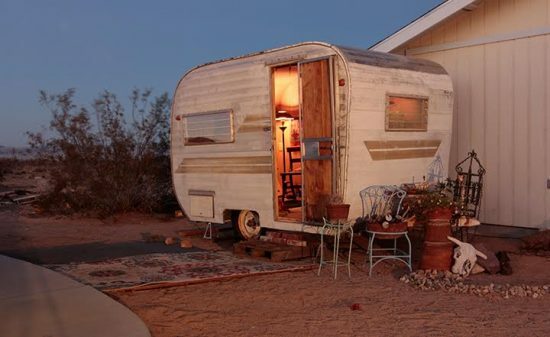 Since moving to the desert, I have had a few trailers that I used for camping over the years: a small vintage Cardinal which I adored, but my husband thought was too cramped, a cabover camper with ‘all the amenities’ (not a ‘trailer’ per se), and a 1973 21″ Airstream Safari, that got devoured in the recession of the late 2000s, along with my marriage. I was trailer free until the Goblin stole my heart last year. My trailer! My heartache! Last February, Constance found this little tiny trailer for me, and the owner was asking only $600. It needed lots of work, but I fastened on my blinders, because I wanted it with every fiber of my being. Reality set in as soon as I got it home, and in the act of unhitching it, I realized that I had probably just made the biggest mistake of my life. I spent the first week desperately trying to figure out a way to unload it on to someone else. It was towable, but a rolling deathtrap. I couldn’t do it. After that, I found a neighbor/friend with a huge shop space and old trailer rehabilitation skills to help me get it at least to the point where it was safe to tow. 2016 turned into the year of everything going wrong that could. Besides the 6 week trailer restoration taking 5 months, there were unexpected vehicle breakdowns, a couple of ruptured waterlines in the house, and I learned not to whisper under my breath, “it can’t get any worse”, because it usually did. By the time I got it towed back home from being (partially) restored, it was July hot, and I was beyond broke. Things have gotten much better, but my boyfriend and I just haven’t had the time to finish the restoration, which means getting it into a useable state: refinishing and putting cabinet drawers and doors back together, building a sleeping platform, etc. While the inside will be like a little jewel case, I am going to leave the outside in it’s decrepit state, with the exception of getting a striped awning. More in keeping with the desert motif. I also bought a bunch of old style large bulb Xmas lights. Oh, do I have plans! —Tell us the stories behind some of your Mobile Domicile paintings. The first time I saw it parked in front of the Joshua Tree Saloon, I knew it would be a great subject. Being parked in a public place, I figured it was fair game, so I took some pictures of it. The challenge was when I got home, while the bus was still painting worthy, but not the highway and its surroundings, at least from the head on angle I wanted to paint it from. So I took some artistic liberty and put it in a desert setting, where It looked more at home. The owner, who also owns the Joshua Tree Saloon, saw the painting when it hung at Joshua Tree Art Gallery, and was very complimentary of it. At the same time in February of 2016, I was also able to meet the creator of the Tin Goose, Dan Van Clapp from Pomona, who was having a show at Taylor Junction in Joshua Tree, at the same time. 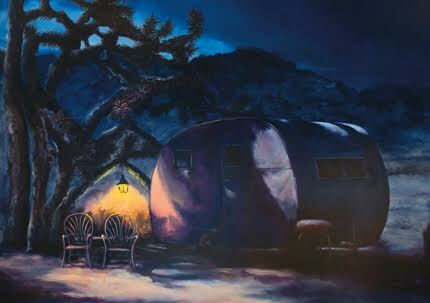 He and his wife were very touched by painting, because he used to take it camping in Anza and Baja California, before selling it to Gerard, the Saloon’s owner. My instincts were correct, The Goose was indeed more at home in a desert setting. 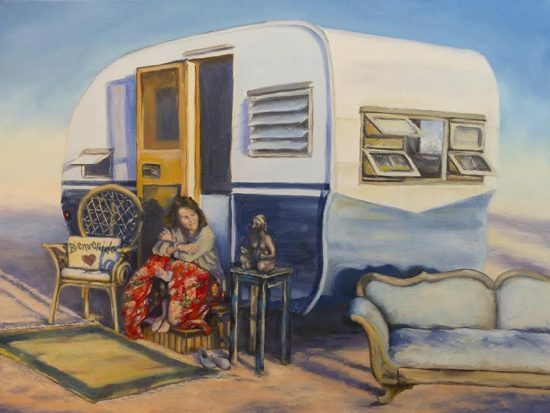 The woman in the painting, Constance Walsh, is also the person who owns the trailer in “Lanternlight-Moonshadow”, the trailer that started it all. I have painted 4 completely different versions of that trailer, as well as 3 versions of the trailer in Dream Small. While people are always encouraged to ‘Dream Big!’, there is a lot to be said for ‘Dreaming Small’ and all of the horizons which that can open up. Come to think of it, that kind of comes around to my childhood revelation that a small house on wheels could take me places. My love of old, odd, vehicles and machinery (another series I did), made this one an obvious choice. It is parked on a lot where the proprietor sells pre-made sheds and firewood. The history of the local desert is also part of military history. 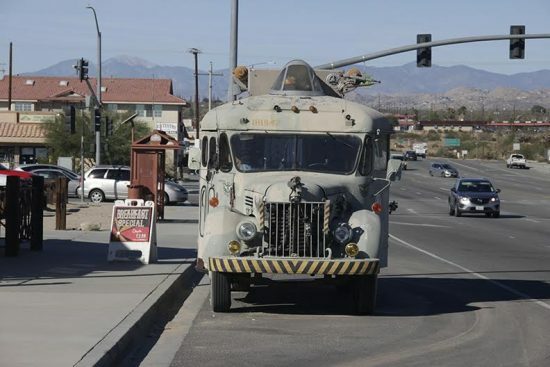 Not only the Marine Base in 29 Palms, but Patton’s WW II training ground east of there, and the veteran soldiers from WW I, who, suffering from the effects of mustard gas, were advised by their doctors to move out to the drier desert climate to relieve their suffering. 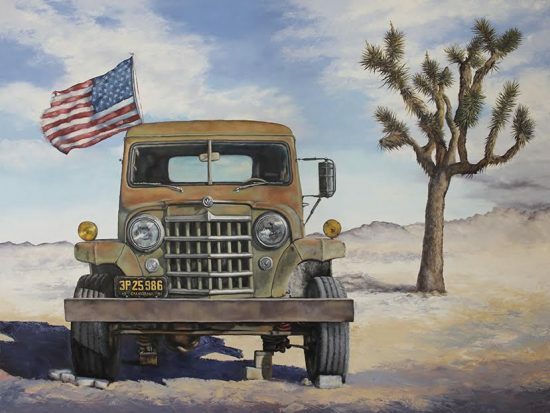 Veterans have been coming out to the desert to retire for a long time, and the proud, patriotic Willys in the painting is no exception. The trailer that started it all. 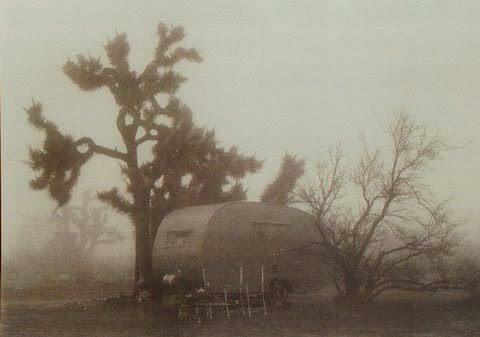 I don’t know why it took so long for my love of trailers to manifest itself into paintings of them, but that all changed when Constance gave me a b&w photograph of this trailer on a foggy day in Pioneertown, that she had taken years before. “Paint this” she said, “it will sell, guaranteed!” Well, I still have that painting, but subsequent versions have sold. I still have the original of this one too, but have sold many canvas prints and cards of it. A note on working from photos: Yes, I do, and No, I do not consider it ‘cheating’. A camera is a tool. The camera’s image sensor does not ‘read’ colors anywhere near as well as the human eye. It took a lot of study on color, nocturnes, and other desert painters and their palettes to train my eye to see what a scene would look like in real life, not necessarily what the photograph shows. I still study paintings for color and technique every chance I get. Learning my way around Photoshop has been a huge aid in getting my photos where I want them and eliminating some of the guesswork. It is like doing a preliminary sketch before starting on the final piece. I don’t always need to take it as far as I did with the Tin Goose, that is an extreme example of the process. Most of the subjects of my nocturnes are from daylight photos. Nighttime photography is tricky, and even then, the camera is even worse at accurately capturing what little color information is there. I get a better result using filters in the software to achieve what my eyes see at night. I have studied nocturne painting a lot and excerpts from “The Life of James McNeill Whistler” were especially enlightening. The idea isn’t to be a slave to applying to canvas what I see, but to persuade the viewer that it is a convincing rendition. February 2015, ‘hanging day’ (I love that phrase! ), at Joshua Tree Art Gallery. Next door is the local Laundromat, there is nothing like the permanent odor of laundry soap that hangs in the air most days…(yuck). As I was finishing up and getting ready to leave, I saw this shiny, glorious ‘thing’ parked out front. I knew a little about Airstreams, and knew this was something ‘other’. What caught my eye the most was not the vessel itself, but the way the desert and the highway was reflected funhouse style on its mirror-like skin. I grabbed one of the photographers from the gallery, and asked if he had his camera along, and could he take some pictures for me? He did, and he would! While this was going on, the owner came out, and I asked if it was okay if I did a painting of his RV? He seemed a bit perplexed as to the why of it, but agreed. The story he gave about the vehicle, was that the owner/builder was an engineer at Lockheed Martin back in the day, and also had access to the parts he needed to build it. He started with a 1950s Cadillac Fleetwood chassis, and from there built it from parts. This painting was accepted into the 2015 ACE show. This grouping has been on a property behind my house since before I moved to Landers 20+ years ago. I have never met the absentee owners, but to their credit, they do come in periodically and keep the property cleaned up. Or perhaps they hire aliens to come in and do it under cover of darkness, because I have never seen anyone there. Much like a civilian version of “Willy’s All American”, this painting reminds me of people who come out here, and whether they intend to or not, seem to sink into the ground and become a permanent part of the landscape. Since it is my only alien themed piece, this is de facto going to be my featured piece for the Alien Drive-In. I have also painted this trailer several times, I wanted to have a little fun with it. When I paint a nocturne, I usually start with a photo taken in daylight and add filters to it with Photoshop to achieve a nighttime, or twilight effect. I was so pleased with the way the image came out on this one, I wanted to produce it as a printed image, besides what would become “Midnight Mojave Sonata”. Remember the aliens I mentioned in “Twilight Years”? Well, this is the way I imagine they would be living here in my neighborhood, pretty much the way a lot of humans do: What do you do when the cabin on your property is uninhabitable? Well, you put a trailer on it, and live in that. For better or worse, code enforcement has caught on to this, and it is now technically illegal, but people do it anyway, and hope the neighbors don’t raise a fuss and turn them in. 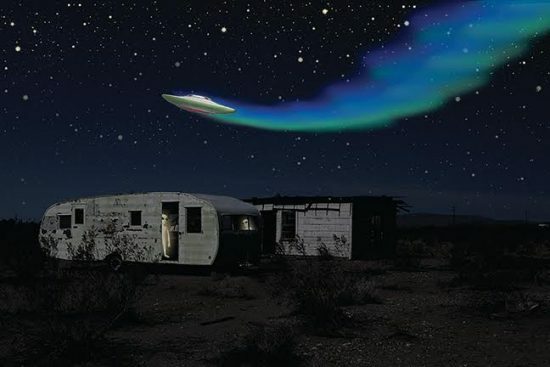 The notoriety of the UFO conventions held at Giant Rock in the 1950s, where people speculated on, and awaited visitors from outer space, is just a couple miles from here and completes the theme. After adding the aliens and flying saucer to the image, I have had it printed onto brushed aluminum, with a sheer gloss finish that allows the metal to shine through. It doesn’t translate well to a picture, you have to see it in person, but the effect is amazing! I have plans to do more in a series on this theme. I wanna go to the Alien Invasion. Sounds like fun. Waah I have to work. Wonderful article! Thank you Ann and thank you Marcia for being a part of La Quinta Museum’s “Tell Me a Story: Women in the Arts” 2017.